Just filled out form for Fibre 100 to new plan, $30 a month cheaper. No mention of DECT handset at all which is a shame, could use a new one. Now have to get our alarm cutover to GSM. I called our alarm company about switching to a fibre based landline. Apparently our alarm is too old to work with those IP modules, and we would need to replace $800 worth of parts. Needles to say I'll stick with copper! 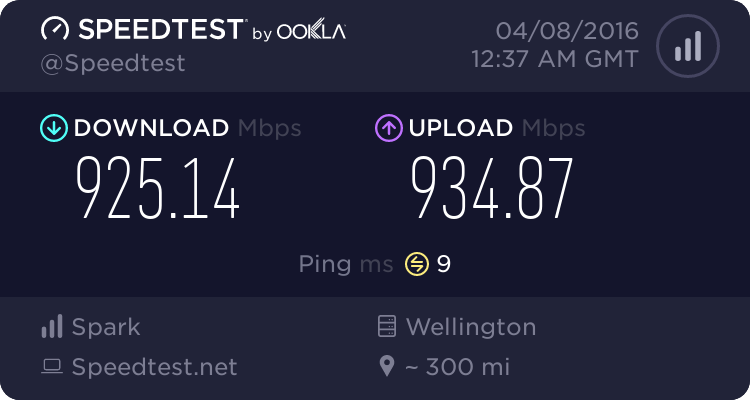 At least we get to keep out 50Mb/s uplink now. HamishO: I called our alarm company about switching to a fibre based landline. Apparently our alarm is too old to work with those IP modules, and we would need to replace $800 worth of parts. Needles to say I'll stick with copper! At least we get to keep out 50Mb/s uplink now. ^^ That is interesting. I was hoping my existing landline ports will work when we switch to Fibre Landline? So I can continue using my existing Cordless phones. I read somewhere Chorus / Spark charge a one-off fee to feed back the wire into the Central Jack so it livens up all the existing ports in the house? I am staying away from changing my current Plan till these teething issues are resolved. I am happy with my 100/50 unlimited with copper landline for now, although paying a bit more. There is no teething issue for that function, its quite clear. Next to the ONT is a white box, these have been installed in recent months prior to Spark's VoF capability. It is an ATA termination. You can use one jackpoint for your cordless phone, etc. When the installer changes you to VoF, or you are a new connection to VoF, you do what is effectively a free self install, connect your phone to the ATA jack on the ONT. Easy, no charge. Or, if you want your existing jackpoints to be useable, the charge is $49 and the network company installer will connect your jackpoint network to that white box, thereby integrating all the jacks to fibre. Good time to also say "dont worry about that jack, but can you liven up this one that was turned off years ago" As the installer will take care of that at the ETP, the plastic box outside the house. The solution we use means you can use normal phones, etc, you do not need a special phone. There should be no compatibility issues, including permanently wired alarms. To all the devices its still behaving like a standard copper jackpoint. Cool, that gives a lot of clarity how the VoF setup works. I will wait for my billing cycle to trigger an invoice (New Fibre connection from ADSL) and then initiate the plan change from 100/50 copper to 200/20 VoF. You said "Next to the ONT is a white box" - there is no White Box for me, there is ONT and then there is a Ethernet cable connecting from ONT to my Modem supplied by Spark (Gigabit model). My ETP is downstairs (outside) and ONT is upstairs (inside) near the patch panel, does the $49 charge cover the costs of wiring it back? I suppose I can just plug in my Cordless near my ONT and can survive as well. If you had fibre connected a while back, there wont be a white box near to the ONT, only recent connections. When it was known how the VoF will be designed, it was added then. If you haven't got one and you go from voice over copper to VoF, the installer will add the white box. Near. Mine is around 200mm. Could be closer or further away, depending what suits. The $49 is solely for integration. If you don't integrate, the white box does nothing, the ATA cable from the ONT to the white box, does nothing. Integration will join the jackpoints to that white box, which connects to the ONT, so you can use the ONT ATA jackpoint. Someone else here will know, but if you want integration, the white box either connects to any other jackpoint (to join the jackpoint network) OR it has to be run to the ETP. I assume the former but I don't know. In my case I have a Sky jackpoint next to the ONT, maybe thats a 5 minute job. Others will entail running cable from outside ETP into the house which would be the same route as the fibre. Either way, the $49 will allow you to have two or more of your jackpoints active. How much hassle that is for the installer is his problem, as with all jobs like this, swings and roundabouts. Thanks for the above. It is now a lot clear. I might not even need a white box beside the ONT if the Integration is not required. Kiwi Alarms quoted me $200 for a GSM module - which is supposedly universal, $800 sounds like a rip. Does anyone know how you reschedule a booking? Can you just call 123? seems like still teething problems between spark and chorus and its the customer who is suffering. My alarm seems quite old and is certainly quite failure prone, hence I am totally understanding as to why one of those IP modules (that either connects the to a mobile network or your router) is no compatible. It is apparently due to a feature called 'Contact ID' being missing from my alarm. When the alarm next fails it may need replacement anyway so we will probably switch to IP then. I was told in no uncertain terms that my alarm would NOT work over VoIP. My understanding from talking to the technician is that the ATA unit would not correct packetise the alarm signals every time. He said only about 1 in 50 signals from my alarm model would get through. Others may have POTS alarms that do work better over VoIP, and certainly many people can just get one of those $200 IP modules to solve their problem. I did note that Matrix Security also mentioned an addition $8 a month for IP monitoring (I'm not sure if that was just the GSM version though) - that did sound like a bit of a rip to me, but it doesnt matter given I'm not going to do it anyway. So for me to switch to a fibre landline (or go naked) it would cost at least $1k up front, require 2 installers to come over (Spark/Downers + Matrix Security), stop our phone from working in power cuts (unless the alarm powered the ONT and router) and reduce my upload bandwidth by more than half - all to save a mere $22, maybe $30 a month! I'm just glad I don't live in Australia where copper lines are cut off a year after fibre is installed. Even $200 for an IP module (and that doesn't include installation) is a lot of money just to switch to Fibre now without ordering two separate plans. A lot of people don't even realise how much better their crappy ADSL broadband can be, and this doesn't help people switch over. HamishO: My alarm seems quite old and is certainly quite failure prone, hence I am totally understanding as to why one of those IP modules (that either connects the to a mobile network or your router) is no compatible. It is apparently due to a feature called 'Contact ID' being missing from my alarm. When the alarm next fails it may need replacement anyway so we will probably switch to IP then. Just be glad you're not getting water, power or gas connected to your house like un-subsidised Fibre installs. Since then you would be up for a $8k+ bill for getting any of that connected. I remember when I moved the power meter from one part of my house to an external box. There wasn't much change in 2k when I did that. I comparison $200 sounds pretty reasonable to me. So it all needs to be taken in context really. In regards to your alarm not working over VoIP. I personally find that quite surprising. Talking with a lot of the guys who did the testing, a whole raft of devices were tested and very few had issues that couldn't be sorted by reconfiguration of the device. To me that raises questions about how robust your alarm is in the first place and if it's even worth having monitored?